From earthy neutrals to bolder statements, the fall/winter 2015-2016 color trends and patterns used for various runway shows have been reflections of everything that embodies hope, fun, and everything natural. A juxtaposition from the flashy pops of colors of seasons past, this color spectrum emphasizes poise and confidence with androgynous hues that can be worn to portray effortless sophistication across men’s and women’s fashion. It is the first truly unisex color palette. For the last season of the year, designers pulled in aspects from the likes of Mother Nature, delivering some earthy balance. This subtle evolution of color is not heavy on bright or pastel hues, but it is being a bit more experimental. 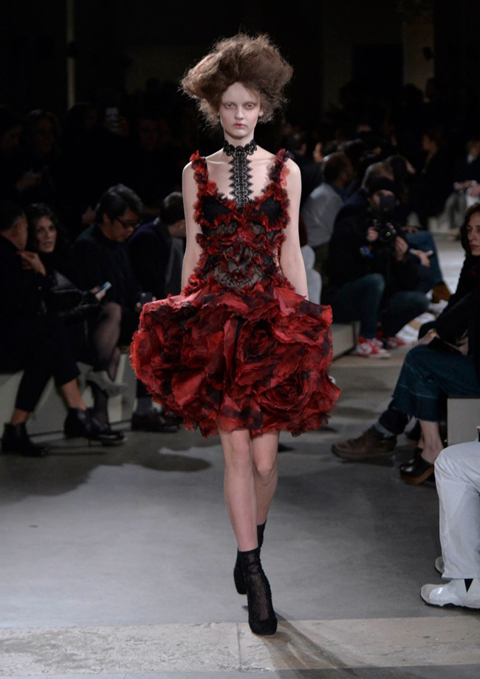 While roses typically evoke the sweetness of spring, they are a big part of the fall 2015 trend, as seen in several Fashion Week runway shows, among them Alexander McQueen. Dusty Rose, as I like to call it, is a soft pink color that belongs in lush gardens, far away from the noise and pollution of big cities; it is of the earth, but holds a touch of divinity to it, reflecting a woman with a persuasive nature who is always calm and composed. The soft pink color was definitely a good fit for the Chanel collection, appearing in a beautiful midi dress and the classic Chanel shoe, paired with draped strands of smoke grey and white pearls. Designer Olympia Le Tan has taken an immediate liking to the dusty color, incorporating it into her ballet-inspired collection on everything from intricate peplum jackets to waist corsets, tulle miniskirts, and even matching gloves. Everywhere you looked on the runways, dusty rose made a big impact, being shown with color-matching jewels and gem stones in a clean, chic pairing that embodies sophistication, poise and elegance. Also inspired by this petal-soft color were designers such as Pamela Roland, Lela Rose, and Dolce and Gabbana. A counterpoint to elegant dusty rose, stormy skies bring us beauty in disguise. Like an overcast day that takes over the whole sky, stormy grey is breezy and cool, yet quite steadfast and literally constant, leaving us in a rather “under the weather” mood. Like the calm before the storm, this grayish color can be represented in a hue that makes a bold statement. Paired with heavy gold chains and jewel-toned gems, this color speaks with subtlety, like a boulder that the waters crash against but never move. It is the perfect color for the professional lady who wants her wardrobe to reflect an inner strength and immovable willpower that ensures every obstacle will be overcome. 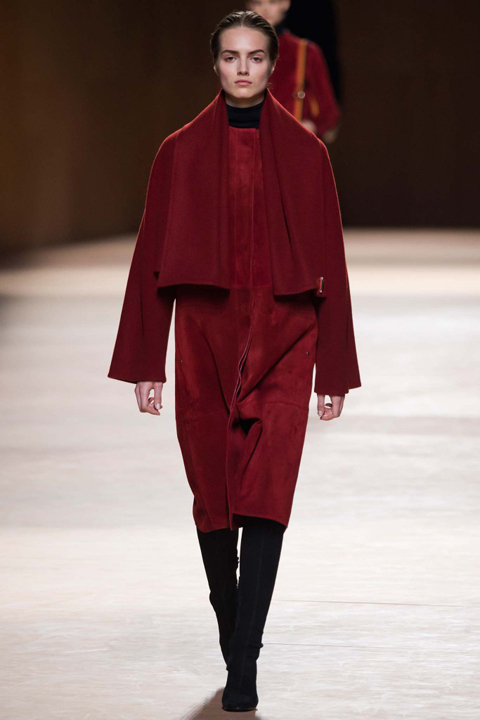 This rich color has been spotted at Nicole Miller, Proenza Schouler, Michael Kors, Stella McCartney, and many others. 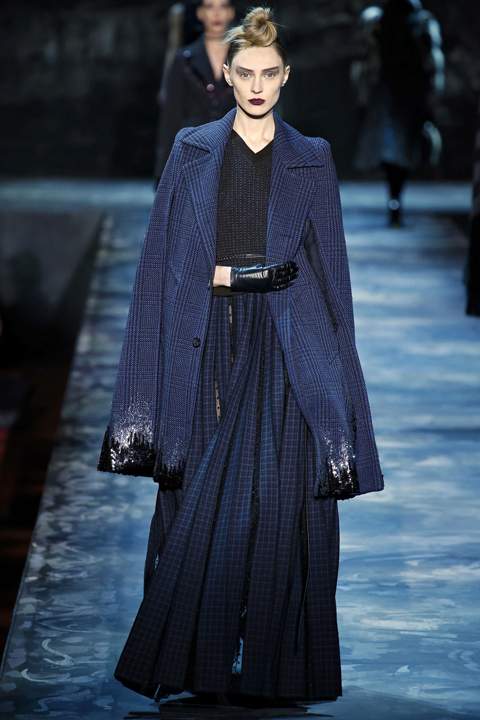 The alluring midnight blues of the vast ocean were very much a go-to color for the fall/winter collections. Inspiring a contemplative mood, the dark blue of a calm ocean leaves us thoughtful and composed, meditative. This cool color offers intrigue yet chic sophistication, particularly when used on pantsuits. 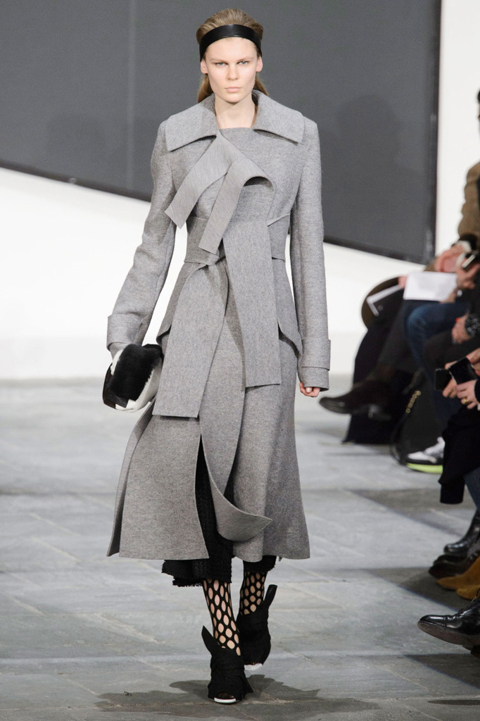 The Chanel collection incorporated it as checked tweed while also weaving in a few other hues. Marc Jacobs certainly knows how to “give us the blues” as he reflected in his neoprene materials used in his New York Fashion Week show. Nina Ricci takes this color to a whole new level with her pantsuits and fringed coats, paired with rich long drop Ruby earrings, and slim stacked gold bangles. We also loved the variations of blues offered by Tory Burch and Barbara Bui. The hue named as Pantone color of the year for 2015, Marsala wine is offered in a whole range of outfits by many a designer. “Marsala enriches our mind, body and soul, exuding confidence and stability. Marsala is a subtly seductive shade, one that draws us into its embracing warmth,” states Executive Director of Pantone Color Institute Leatrice Eiseman. 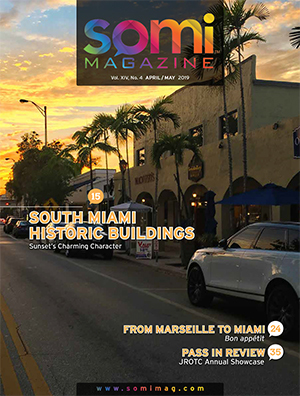 It is a versatile color that is equally appealing to both sexes, as are most of the other colors chosen to represent the fall and winter months of 2015. Marsala is a color that embodies a woody flavor, and that flatters most skin tones. Its rich, full-bodied red-brown color brings warmth and a flair for drama to any piece it is used on. The texture and nearly matte finish lend sophistication to its more organic sheen, and add glamour and luxury to your look. Maison Margiela showcased Marsala-hued pieces in a lacy, short-sleeved mesh top and sequined dress with fluttering paillettes and an open collar. The color also appeared in the fall 2015 collections of Tommy Hilfiger, Emilio Pucci, Hermes and many other notable names n fashion. This season’s hues cater to everyone’s fashion cravings, skin tones and personalities. With so much to choose from, it’s up to you to decide what trendy shades you are going to paint your new wardrobe in!